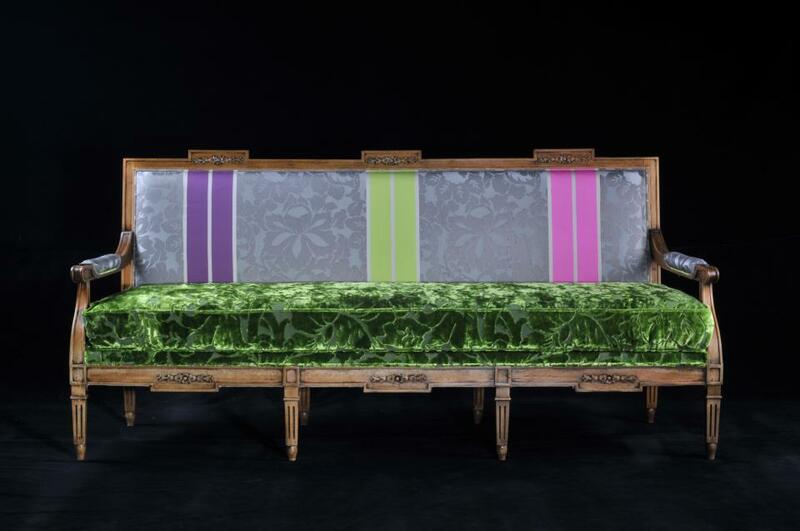 The world of Green Luxury just got better: Designs by Thierry Barbier of Lyons, takes vintage French frames and covers them by hand in Decopage, then he searches for the most unique fabrics in luxe combinations that take French furnishings to a whole new level. Monsieur Barbier, who has been featured in Marie Claire Magazine, has taken the world of French luxury furnishings into the couture fashion world. Every angle of his pieces are carefully considered with the insides or backsides just as beautiful as the fronts. The recycled frames and mix of fabrics and colors is often surprising, and witty. We discovered Monsieur Barbier at Paris fashion week when we were startled by a chair in a hallway, that later led us to discover his unique work that continues to be surprising and creative.